In a calculated, tranquil tone, the girl answered: "I would reinstate the death penalty." Erdogan openly and frequently declares his ambition to "raise devout generations." She was merely one of the products of President Recep Tayyip Erdogan's ambitious social engineering project to "raise devout generations." 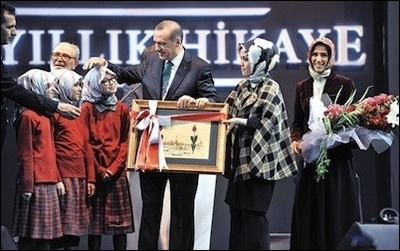 Erdogan participates in a celebration marking the 100th anniversary of the religious Imam Hatip school system, January 2014. A new Education Ministry draft curriculum removes all mention of world-renowned Turkish pianist Fazil Say, a vocal critic of Erdogan, from a 12th grade music class chapter. The draft, however, is not only about additions, but also about dropping the names of unwanted characters from the curriculum. 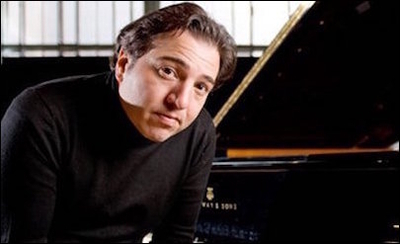 For instance, it removes all mention of world-renowned Turkish pianist Fazil Say from the 12th grade music class chapter on "Music Culture," which covers Turkey's Western music composers. Say has been a vocal critic of Erdogan's Islamist policies and was subjected to a controversial and long-lasting blasphemy case, in which he was charged and convicted over tweets in which he quoted the 11th century Persian poet Omar Khayyam, in 2012. Appealing his 10-month imprisonment in the case, which was suspended for five years, Say was acquitted in September 2016 on charges of "insulting religious beliefs held by a section of society." The Organization for Economic Cooperation and Development (OECD) found that the number of Turkish 15-year-olds who scored below average on the triennial PISA test is three times higher than the number of students who scored below average in more successful countries. Some 31.2% of Turkish students below 15 years of age underperformed in mathematics, sciences and reading. In contrast, only 10% of students in countries that neared the top of the list underperformed on math, sciences and reading. Between 2012 and 2016 Turkey's ranking dropped from 43rd in science to 52nd and from 41st in reading to 50th.